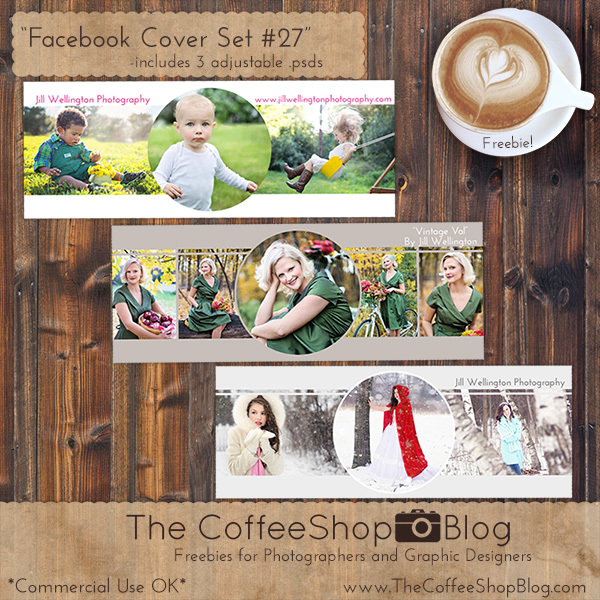 The CoffeeShop Blog: CoffeeShop "Facebook Cover Set #27"! CoffeeShop "Facebook Cover Set #27"! Today I have a set of three adjustable Facebook covers. They come with/without borders and you can change the background color plus add a logo or text. They are psd files so you can add your images using clipping masks (tutorial and free action). I want to thank Jill Wellington (Etsy Shop, Facebook, Blog, YouTube Videos, Pixabay) for allowing me to use her images in my examples. Download the CoffeeShop "Facebook Cover Set #27". You can also download it here. You are so welcome Lydia! Any directions on how to customize the facebook covers in photoshop?